Last night, we met some friends for dinner at Cafe Ino, and I didn’t manage to save any room for their nutella panino. We woke up this morning to hear what could only have been ginormous raindrops hitting our skylight, and I knew it was a perfect day for a decadent brunch. We made nutella ricotta stuffed pancakes and roasted home fries. First, whisk the flour, eggs, milk, butter, salt, baking powder and sugar in a mixing bowl until there are no clumps. I�EUR(TM)m low tech on baking gadgets so I use a hand whisker. Second, mix in the ricotta cheese and nutella. Stir in the almonds. Adjust the amount of milk as needed. The batter should pour easily but not be too runny. Third, heat a griddle and when hot, drop a pat of butter or vegetable oil onto the surface. Drop about a 1/4 cup of batter on the middle of the skillet. When the pancake starts to look firm and bubbles a bit on the top, use a spatula to flip. Cook until the other side is browned. Fourth, to keep the pancakes hot while you make a batch, you can either store each pancake on an ovenproof plate in the oven on low heat (~125 degrees) or place a piece of aluminum foil over a plate pressing it down on three sides leaving one side open to slide the pancakes in. Fifth, enjoy with a pat of butter topped by honey or syrup. I’m a salty and sweet person, and, like most desis, I love potatoes. 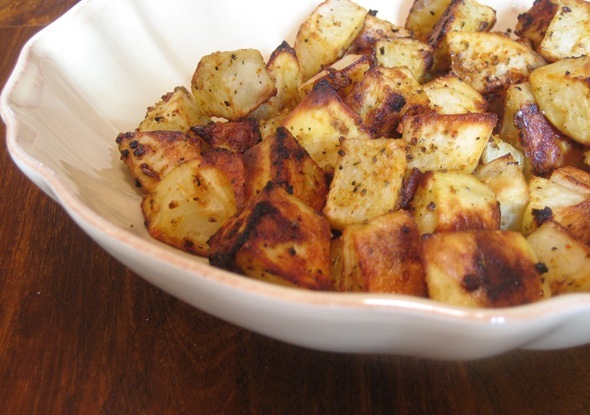 Roasted home fries are an ideal breakfast side because you can start them up and throw them in the oven while you make the pancakes. First, preheat the oven to 425 degrees. Second, peel and dice the potatoes then put them into a mixing bowl. Drizzle the olive oil, a generous sprinkling of sea salt and dried herb seasoning* and lal mirch. Third, hold a plate (top side facing up) tightly over the mixing bowl and shake well until the potatoes are evenly coated. I do this over the sink just in case! Fourth, cover a cookie sheet with aluminum foil and spread the potatoes onto the sheet. Bake for about 25 minutes or until tender. Turn the pieces if they start to get too browned. Broil on high for 2-3 minutes to get a little crunchiness. Serve hot. *I use Trader Joe’s 21 Season Salute – it’s a mix of onions, garlic, black pepper, celery seed, parsley, thyme, rosemary, oregano and more but any italian seasoning will do. Now that I have a lot of ricotta leftover, I would love to hear about ideas for using it! A yummy recipe with a yummy picture. This sounds like the ideal breakfast, sweet and savory. I love the idea of adding nutella to pancakes! What a delicious idea :). I’d like to include your recipe on our blog, please let me know if you are interested :). Sophie, that sounds really interesting…I sent you an email and look forward to learning more about your blog! Oh my, how about breakfast for dinner? Hi Nithya, I came here from Foodworld aggregator. You have a very good space here and I like your style of writing. I was going through a couple of pages but this one caught my attention. I too love Nutella so does my son. I think he will gobble these pancakes in no time. @Madhuram, thanks so much for the nice compliments! 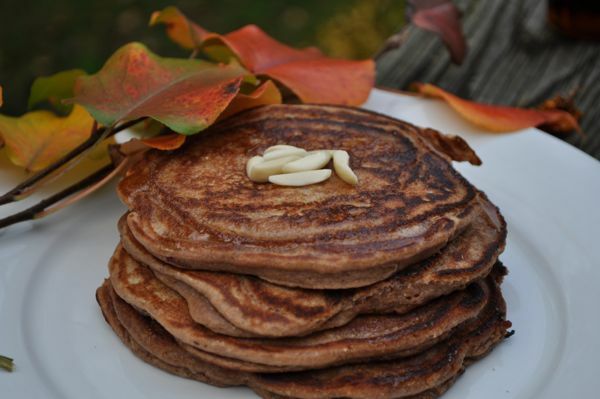 Let me know if you make the pancakes…hope you and your son enjoy them. I just stumbled on this page recently lol. Sounds really good. One question Nithya. When you made the pancakes, how amazing were they? Is there any thing/ingredient you would change?